With its [MMD] in-built majority in the NCC, it will be able to write a constitution for this country unfettered by the input of others. In this way, the next constitution of this country will be an MMD constitution, not a Zambian constitution. If anyone wants to deceive himself that Levy will come up with a constitution that will endure the test of time they are cheating themselves. What is being set is a precedent that those with the parliamentary majority and are in control of government will in future also be able to do the same; to come up with a constitution of their own in a similar way. It is not malice to say that the MMD has an in-built majority in NCC. This is something that can easily be proved arithmetically or mathematically. The Post clearly frustrated by the current approach to the NCC. Interestingly, the editorial rightly notes that any party in the future with sufficient majority could alter any new proposed constitution. But in doing so, the editorial ignores the central point which, to be fair, it has noted in the past. It is not the question of setting the 'wrong precedent' that worries people, its actually the opposite. The current party of Government may alter the constitution beyond repair. An MMD driven constitution could quite easily ensure that MMD remains in party forever! As a party in Government the MMD has little incentive to change the status quo, hence the need for fair and balanced representation across the nation including Zambians abroad. But assuming a fair and balanced representation was difficult to achieve, the hope may lie on certain groups within the NCC whose personal incentives may drive them to an outcome that is actually optimal for the nation as a whole. Question : who do you think might possess these 'personal' incentives that may help deliver an 'ideal constitution' for the Zambian people? And why? Update : A copy of the much debated National Constitutition Conference Act 2007. Among the representatives should be "two representatives of traditional healers" - Part 2(II)4(i)e. Crucially, no representation from any Zambian organisation abroad. How business friendly is Zambia? The World Bank yesterday released its annual ranking of the ease of doing business in 178 economies. Economies are ranked on their ease of doing business, from 1 – 178, with first place being the best. A high ranking on the ease of doing business index means the regulatory environment is conducive to the operation of business. This index averages the country's percentile rankings on 10 topics, made up of a variety of indicators, giving equal weight to each topic. Best to focus on the African rankings - not much point to compare ourselves to the heavyweights like Singapore. Zambia is ranked 11th in Africa. Interesting to note that it ranks quite well on "paying taxes" relative to other African nations. No prizes for guessing why that is :). Update: Also worth checking out the Milken Index released early this year - it measures firms' access to capital accross countries. The Post reports that 'Zambis has bounced back to a single-digit inflation rate, which now stands at 9.3 per cent for September 2007, down from 10.7 per cent last month'. The CSO have not issued the September 2007 bulletin yet, but you can access the August 2007 version here. According to the opinion of those that matter, Zambia is very corrupt and appears to have made little progress in the fight against corruption. Transparency International have published the 2007 Corruption Perceptions Index (CPI). The CPI score indicates the degree of public sector corruption as perceived by business people and country analysts, and ranges between 10 (highly clean) and 0 (highly corrupt). Like in previous years (actually since LPM took over in 2001) Zambia's score has remained at 2.6. To put this in perspective - this means that currently Zambia is perceived to be more corrupt than say the West African state of Ghana (3.7) or our neighbours Tanzania (3.2). Update 1: if you are not depressed by the CPI score, you can also check out the latest Ibrahim Index of African Governance. Zambia is ranked 19th in Africa. I do think the Ibrahim Index needs further tweaking though - it has some odd scores in there e.g. Zimbabwe's high score on safety and security. My thanks to Gershom for bringing this to our attention. CHIEF Government spokesperson, Mike Mulongoti, has castigated Transparency International-Zambia (TIZ) for failing to acknowledge the progress Zambia has made in the fight against corruption under the leadership of President Mwanawasa. Mr Mulongoti, who is Minister of Information and Broadcasting Services, said it was sad that organisations like TIZ had forgotten why they were established. He said TIZ had instead become addicted to criticising Government programmes. Mr Mulongoti was speaking to journalists in Lusaka yesterday. He said although the Government had made several efforts to reduce corruption, all the positive achievements had been ignored by TIZ. The minister said progress achieved should be appreciated by all Zambians and appealed to people with questions to get clarifications from the Government instead of rushing to the media. He wondered why TIZ would fail to acknowledge the achievements Zambia had made and yet its sister organisation in South Africa recently commended Zambia on its efforts to fight corruption. "It seems our colleagues have forgotten their objectives and have chosen to go politicking because they seem to be addicted to criticising Government programmes," he said. ......It is clear even from a biased observer that corruption in Zambia has relentlessly been fought against and has actually taken quite a knock. It is surprising therefore that after all such efforts, it should be impugned that the Government has not done enough to fight corruption. One of the most doubtful aspects about the assessment of corruption levels in Zambia is that both the criteria and methodology used are not widely known to the public. This is crucial since in any engagement that involves two parties, the rules of that engagement must be clearly articulated to both parties. Independent observers and evaluators should, for instance, be in a position to gauge weather the methodology is suited to what is being assessed or whether the criteria is appropriate. There are also questions about the form of assessment itself. Given the nature of the parameters, there should be a mechanism to measure, in some way, the level of actual achievements in the fight against corruption instead of mere ranking of culpability as is the situation now. The fact that corruption indicators are either dismissed as irrelevant or contested in many countries could point to the fact that the whole manner of doing things is not above board. At the end of the day the whole undertaking is in actual fact a perception index. Clearly then, it lacks empiricism and can therefore not be taken as the universal yardstick. The bottom line is that corruption is an evil that all right thinking men and women fight in truth. The fight should not be complicated by those standing outside and contributing no effort lest they discourage those genuinely committed to the fight. A uranium mine at North Kariba by 2010? Canadian uranium producer Denison has plans to develop a new uranium mine around the Zambezi valley, just north of Lake Kariba. Apparently the fact that there might be environmental concerns and that Zambia at this stage has no specific permitting legislation covering uranium mining (still in draft) is no stumbling block to the might of Denison. The Kariba project, if approved (or is it 'when approved'? ), would coincide with the Gwabe uranium project. Separately Lumwana is so excited by the uranium it has found that a dedicated uranium processing plant is in the offing. No doubt there's more to come in this area. Perhaps the The Times reporter was correct in his assertion that supremacy does really beckon for Zambia - or is for investors in Zambia? The answer must wait for the new legislation by the end of the year. A genuine need or just for jobs? The Zambia Institute of Planners are calling for a new Planning Authority with the aim of ensuring 'all physical development coming from both local and foreign investors is better coordinated and harmonized'. A bit vague one might say. Of course in theory there is no limit to what a new planning authority might do, but I think this is one of those areas where if the planning objectives aren’t clearly stated you could create unnecessary bureaucracy (and of course jobs for members of the institute). Some might certainly argue that Zambia's current development problems are not due to the lack of an effective (independent?) planning authority, but due to poor land reform. "Government must support and promote arts and crafts for the rural population. There is a market for Zambian paintings and traditional crafts in the west. Government, through its missions abroad must identify these markets and link producers to the market." The Handicrafts Association of Zambia would certainly welcome a more proactive approach from Government in this area. Peru's hat making provides a good example of how small initiatives can tap into rural culture to help create employment. In Zambia we have recently seen growth in village tourism. Beyond culture, the Zambian Soap Company provides a good example of what can be accomplished working with local people. In short, there are plenty of job stimulation opportunities for rural Zambians. The problem that the villages face is not being aware of these business opportunities, lack of capital and of course the challenges of marketing themselves abroad. In all of these three areas Government can do something to help. In terms of business opportunities, Government can work with rural Zambians to identify 'opportunities' for job creation. The key here is for Government to create an enabling environment where local people can create employment for themselves within the existing cultural settings. The 'enabling approach' is critical because 'opportunities' would would vary from place to place and we cannot simply expect everyone to make crafts! Lack of capital can be solved by improving access to credit. We have touched on this issue many times on this blog from different angles (e.g. here, here, here, and here). Finally, marketing abroad can be improved through creating networks. Kashikulu proposes using Zambian embassies abroad, I prefer using Zambians abroad. There's much that Zambians abroad can do to group together and raise capital and tap into these business opportunities and work with Zambians in rural areas. Government can proactively engage Zambians abroad to create networks. There's much that can be gained from collective investments from Zambians abroad, instead of investing individually. The problem is that coordinating failures inhibit such networking and that is where Government should be stepping in to help. We have government workers at Nkandanzovu health centre and the basic school. These get their salaries from Kalomo but are forced to spend so much money on travel as they have to go to Choma first before connecting to Kalomo. Worse still, farmers also have to get their money for their produce sold to FRA from banks in Kalomo…. The Chizuni bridge [linking the constituency to the nearest health facility at Macha Mission Hospital in Choma] was completed two months ago but has developed serious cracks that pose grave danger to traffic….The only way government can motivate the people in the constituency to continue recording bumper maize harvests is by giving them good roads to market their produce. We are worried because the rainy season is drawing nearer and the road network has remained in a poor state. Dundumwezi MP Edgar Sing’ombe forcefully demonstrating the importance of transport infrastructure to human development. Without adequate transport infrastructure we can forget about education, health and empowerment (agriculture) - the three of the four crucial areas of human development. Delivering significant transport infrastructure is not cheap. This is why I have argued that need to find creative ways in which new investment in the country can be tied to broader local investment in the transport sector. The model that is needed is similar to the framework that the UK has adopted under Section 106 of the Town and Planning Country Act (1995). This UK legislation basically makes it a condition that any new investment in any local area of the UK should be conditional on providing some minimum level of investment in schools, transport and other things, if the local authority deems necessary. Other nation’s have similar approaches. Unfortunately Zambia has no such legal basis, and where local authorities have tried to take the initiative, they have met obstacles with Solwezi being the latest. The Zambia Wildlife Authority (ZAWA), with one man at the helm with any experience and the qualifications to back it up, Dr Lewis Saiwana, is beyond repair, beyond reconstruction. That it has not even made the necessary pension contributions for its own staff is proof that it is time to call it a day. At HQ, ZAWA is a shambles, unable to pay consultants as promised, unable to administer the hunting industry and the quota system, unable to pay all the Community Resource Boards who are responsible for hiring village scouts, unable to answer a simple letter. It is time for Government to accept that the management of protected areas and its wildlife, and the wildlife of customary areas, can no longer be run by a highly centralized statutory body with a weak supervisory board. It is time to put all National Parks and Forests out to public private partnerships, and in customary areas, to place the ownership of wildlife in the hands of development trusts which incorporate customary leaders, local councils, the villagers and NGOs. Here is a piece I did for Global Voices on the the rise of the Zambian blogsphere. It provides a short review of some of the interesting blogs on Zambia that are out there (that are updated fairly often). British Airways will cancel flights to Zimbabwe from end of October. A move that is likely to prove beneficial to regional airlines including the Government owned Air Zimbabwe. Except this is very bad news for Zimbabwean consumers in the diaspora. 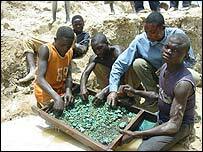 BBC News report that China has signed a deal to loan the Democratic Republic of Congo $5bn to develop infrastructure and mining. "This is the largest single loan to any African country of the$20bn that China has pledged to finance trade and investment in the continent over the next few years. A first phase of $3bn will finance big transport infrastructure projects in the DR Congo, including a 3,400km (2,125 mile) highway between the northeast city of Kisangani and Kasumbalesa on the border with Zambia. There will also be a 3,200 km (2,000 mile) railway to link the country's southern mining heartland to the main Atlantic port of Matadi in the west. Additional plans provide for the construction of some 30 hospitals, more than 100 health centres and two universities"
In exchange, China will get rights to DR Congo's extensive natural resources, including timber, cobalt and copper. I have this worrying feeling that Kabila may be selling his people at price a price their grand grand children may regret. For one thing, I can only see one way China would make sure that she gets the return on her investment in a very unstable country. On the inseparability of economic and military help see the blog here. ...countries that have multiparty competitive elections experience lower levels of corruption over time but, this genuine democracy comes at a cost of higher levels of corruption in early stage. Corruption appears as negative externality of democracy in early stage. In other words, democracy not only matters for corruption but, equally important, has a threshold effect.. The 'Solwezi Model' based on offering appropriate local incentives in exchange for significant infrastructure investment appears to have met its death last week. You can read the story here. Our overall conclusion is that the relationship between income and democracy and the widely-accepted modernization hypothesis need to be reevaluated, with much greater emphasis on the underlying factors affecting both variables and the political and economic development path of societies. Our results indicate that countries have embarked upon different development paths, most likely at some critical junctures during their histories, and while some paths have led to democracy and prosperity, some others involved non-democracy and relative poverty. Although democracy and prosperity coevolve along the “virtuous” development path, there is no evidence that income has a causal effect on democracy conditional on the development path. The BBC is banned from Zimbabwe, but one of their reporters Sue-Lloyd Roberts has gone there undercover. You can watch the 20 minute video here. Writing in the Observer, Dr John Sentamu likened Mr Mugabe to the Ugandan dictator Idi Amin. "Mugabe is the worst kind of racist dictator," he wrote. He told the BBC that Gordon Brown should lead a coalition of countries in mounting stricter international sanctions against Zimbabwe. The archbishop highlighted a recent report from Zimbabwe for BBC Two's Newsnight which exposed drastic food shortages, infant mortality, average life expectancies in the mid-30s and poor living conditions in townships. "The appalling poverty suffered by those who queue daily for bread in southern Harare is a world apart from the shops, boutiques and sprinkled lawns of northern Harare, where Mugabe's supporters live in palatial surroundings," he said in the newspaper. At the end of apartheid, average incomes in white areas were five times higher than those in black areas, but latest statistics show that the emerging black middle class – credited with creating the biggest economic boom in South Africa since the Second World War – is now responsible for more than a quarter of the country’s purchasing power of £44 billion. Nowhere is that more visible than in Soweto. The roads are full of luxury cars, driven by fashion-conscious young executives. Restaurants and clubs have opened in many of the township’s more affluent areas. Sometimes it is easy to dismiss the 'brain drain' as a problem being faced by all developing nations in equal measure. As the above map (click to enlarge) from a new OECD report shows, the severity of the problem does show some variation across the Africa and the world at large. The map only considers the percentage of share (%) of a country's nationals with university education living in an another OECD - I suspect Zambia's share currently 'more than 20%' would be even worse if we looked at how much it has lost to non-OECD countries! Related discussion can be found here. I believe Mr Msika is exhibiting what someone has called the politics of poverty. However, in reaching that conclusion, we also have to accept that Mr Msika actions are part and parcel of democracy - the ability to freely choose which organisation you wish to join and even the freedom to change your mind after 48 hours! The challenge for political parties, is how to build parties that are resilient in face of this politics of poverty. We have tangentially touched on these issues here. The Cato Institute have released the annual Economic Freedom Report. It uses 42 measures such as voluntary exchange of goods and services, freedom to compete, and security of privately owned property and ranks countries on how well their policies encourage economic freedom. 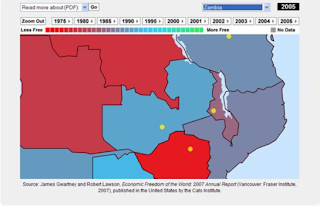 This year's index comes with an interactive map which will let you check out how Zambia performs against it neighbours. The new index also includes elements based on the World Bank's Doing Business database. I believe that as a nation we should shake off the despondency, defeatism and fatalism that has engulfed us for so long and start to believe in ourselves as a PEOPLE and as a NATION. I am willing to accept that there's some positive relationship between optimism and income. However, I am not convinced by Pandwe's proposed cure since it ignores the very relationship on which his broader argument rests. If optimism is driven by income levels, then Pandwe's cure is incorrect. Zambians cannot simply get up one day and feel confident about the future. Do something to their incomes and may be your might just get them to be optimistic! It is most unfortunate that some foreigners have been bundled out of the country unceremoniously on flimsy grounds. The Immigration Department is now being used by Government to fix some foreign investors for reasons that have little to do with their competence. Some of these foreigners have been targeted for deportation either because they are perceived as whistle-blowers or have not cooperated in cutting deals with influential individuals in government. The Immigration Department, following instructions from the top, has used its ‘powers’ to throw some foreigners out of the country by not awarding them visas, not renewing their self-employment permits or simply by declaring them prohibited immigrants. There are currently several cases in court involving foreign investors contesting the Immigration Department’s decisions not to renew their self-employment permits. But in extreme cases some foreigners have been thrown out without following the due process of the law or the state has simply ignored decisions of the courts. In one instance, a Danish national was deported on the instructions of a Minister simply because of a personal quarrel. It would appear that the government’s poor administrative and regulatory capacity is being abused with a high-handed approach in the treatment of some foreign investors, who are being used as scapegoats for government’s policy failures. In my view fiscal policy must aim at developing state capacity to collect taxes and regulate economic activities to enable it meet the exigencies of economic development. Searchers are Zambians who are making a difference on the ground, and are not waiting for the Government to act. By this definition, Amon Simutowe qualifies as our latest searcher for becoming the first sub-Saharan Chess Grandmaster. 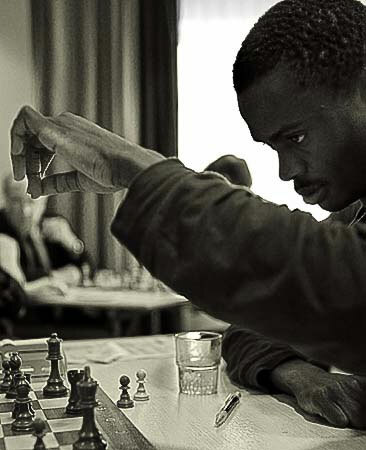 Okay I am being a little biased here (being a chess enthusiast myself), but I think in so far as Amon's achievements give plenty of encouragement to others to take up the ancient game and puts Zambia on the map for something positive, we must applaud him. You can read more about Amon's achievements at Chess Base and if you have the Fritz 10 database, you should find one or two games in there by him. Gershom Ndlovu has also done an interesting piece on Chess, A game many Zambians misunderstand. "The shops near my home [Bulawayo] are completely bare - no food and no household products either. It's actually faster to travel to Livingstone for foodstuffs than to wait in the queues, which have no guarantee." Quote from a Zimbabwean woman - BBC News article Zimbabwe collapse fuels cross-border trade . The Christian Science Monitor article Elusive credit means Zambians build slowly highlights an issue we have touched on many times on this blog from different angles (e.g. here, here, here, and here). Businesses working with foreign investors can construct buildings quickly. Business is booming in some fast-growing commercial hot spots of Lusaka, like the Manda Hill neighborhood. But banks, until recently, found it more profitable to invest in government securities than to loan money to individuals or even small businesses. In an economy where only 20 percent of the workforce, at most, has a formal job, most people are considered credit risks. Credit bureaus don't yet exist. While good housing is scarce, securing ownership of land can be difficult and cumbersome. And for those who can get a loan, interest rates are often a huge deterrent. The average commercial bank's lending rate recently exceeded 40 percent, and is currently about 28 percent, according to the government. According to a 2006 World Bank study, less than 1 percent of Zambia's 11.5 million people had an outstanding bank loan in 2005. More broadly, only 6.2 percent of Zambian adults have bank accounts, and almost two-thirds of those accounts hold less than $100. “At the moment, we are doing the right things first before we can start exploiting this resource. What we are doing first is to look at legislation that is available in terms of this resource and updating this legislation,” he said. Thereafter, the country would also examine the legal and institutional mechanism and base it on international practices and experience.“But I am happy to say that tender documents are being prepared and we hope that we will be able to invite applications for companies to do further exploration work to determine the depth of the material and the size of the wells,” he said. Mwansa said that there was room for greater minerals discovery in Zambia because only 55% of the country had been geologically mapped and 45% of the country had still to be surveyed. The ministry was carrying out further exploration in areas of further potential where there was potential for large-scale mining based on the initial finding reported. ‘My ministry has also despatched a team to the western and eastern parts of Zambia to assess the presence of oil and gas in those two areas,” he said. 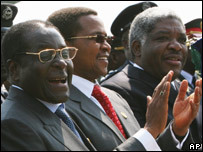 The diplomat said Mugabe angrily asked: “Who are you, Mwanawasa? Who are you? Who do you think you are?” “Mugabe also said he was aware of Mwanawasa’s recent meetings with western intelligence agencies on Zimbabwe. He said he would ‘not allow Mwanawasa to sell out Zimbabwe as he has done to Zambia’,” the diplomat said. Ben Mwila questions whether academic qualifications signal anything about your leadership quality. Interesting that no one ever entertains the other extreme being true - poor academic qualifications do not signal anything about your ability to lead the nation. The Times of Zambia quotes the Finance and National Planning Minister's revelation that Zambia's external debt stock as at the end of last year stood US$957.4 million while domestic debt stock was K8.9 trillion. It does indeed appear that the prospect of an "externally" low debt Zambia is not one which some of us will experience in our life time even with the debt relief! "With the projected growth of the economy of at least six per cent per annum and the projected debt service requirements in the coming years, the Government is comfortable that it will be current on all debt service obligations"
Actually, Magande's 'good news' could well be bad news down the line. Really what he is saying is that Zambia's booming copper industry will allow us not just to grow but potentially lead to a stronger Kwacha. Except then we really do have the dutch disease. Perhaps now is the time to really get on with those agricultural and land reforms? The fear is that when copper really does boom, it may not be good news for the farmers. This is why Zambia needs to diversify, and diversify hard. Tourism also needs to improve - that requires push for greater liberalisation of air travel and improvement in hotel infrastructure. And of course there's the not-so-small problem of our domestic debt which is currently crowding out private sector borrowing. The Post Newspaper apparently will now include a bi-monthly supplement which will track the progress of private sector development in Zambia, as a way of holding Government to account. The Post hopes to regularly publish indicators that measure government performance over time. A weekly radio and TV program is planned in due course. Not sure whether it is available on the Post website, but you can sample the first issue here. Another beautiful example of the benefits of technology - UN dispatch reports on how PDA's are saving lives in Zambia. But through a year-old pilot program, Zambia is replacing paper-based health surveys with those used on PDAs (personal digital assistants). This means no data entry, no cumbersome clipboards, and most importantly no waiting weeks or months for data entry clerks to enter stacks of paper into a computer for analysis. Zambia today is helping to lead a public health revolution that has the potential to improve the lives of millions of people in the developing world. By switching from paper-based to mobile-enabled digital health systems, Zambian health workers are empowered with new 'eyes and ears' in the field-devices that increase the speed and accuracy with which vital health information can be collected and recorded. These PDAs, sometimes more powerful than laptops of the recent past, quickly are becoming a vital public health management tool. The New York Times on Zimbabwe's desperate attempts to staunch inflation using price fixes and now the wage freeze. In the meantime the Financial Times reports that companies are starting to go local, while others simply pack up and leave. The Sunday Post editorial has an interesting commentary on the costs of bye-elections following a recent defection by a certain PF MP to the ruling party. Money that could be used to improve our health and education services, our road and rail network and other infrastructure is unnecessarily and unjustifiably being spent on by-elections. We are told that the cost for a parliamentary by-election cost the taxpayer between two and three billion kwacha. It is certainly not being responsible for our politicians to jump from one party to another, causing unnecessary and unjustifiable by-elections that cost the taxpayer billions of kwacha. There is need for us to try to understand why our multiparty political system has become a circus, a zoo where politicians are jumping from one party to the other with so much ease like monkeys jumping from one branch or tree to another. It is evident that our politics is not premised on any principles; our political parties have no clear outlooks or characteristics other than tribal, regional that truly define them. I certainly agree that bye-elections are costly to society since they misallocate resources that could be usefully employed elsewhere. I question though where the K3bn figure comes from. But assuming that it is correct and actually represent a real cost to society, then we must ask the obvious question : how do we minimise the costs of potential bye-elections? The answer certainly is not through the ‘dedicated fellow hypothesis’ as the Post Editorial intimates. The idea that somehow we can ‘hope’ for principled leaders to emerge in a realm full of poverty and inadequate institutions is perhaps outside the boundaries of natural logic. Parliamentarians like everyone else respond to incentives. The ‘monkey business’ suggested by the Post editorial happens because of weak incentives in our electoral system that does not penalise people who cross the floor for financial gain. We must therefore fix these weak incentives. Dissuade MPs from switching sides just for personal financial gain. Minimise the possibility of punishing those who switch for genuine reasons and maximise the possibility of punishing those who switch for personal gain. Ensure that the people who elected the chap are not penalised – the emphasis is to ‘punish’ the wrong doers i.e. the chap who switches the party incorrectly not people who elected him! Option 1: eliminate bye-elections completely in the event of defections – if someone defects the seat becomes vacant. That way the people directly ‘hunt’ the defector down. The fear of the mob should be enough incentive to dissuade individuals from switching sides without strong moral persuasion. So hopefully no one ever defects. Option 2: eliminate bye-elections but this time round the seat remains with the Party. In this case, PF gets to keep the seat and choose whoever they like without going through the voting process. Option 3: allow bye-elections but never let the chap who switches side ever contest the seat again. Unlike Option 1, where if the chap successfully avoided the mob anger he /she can contest again, with this option, the chap never gets to see the light of day in Parliament. Option 4: allow bye-elections but never let the chap contest the seat again for the duration of that parliament. 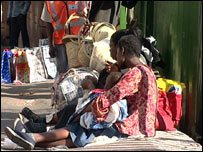 Now, more than 80% of the Zambian population lives, in or near urban cities. Why then do some still choose to live in areas that are too remote - cut off from easy reach of public service infrastructure, that in some cases, areas that can no longer sustain safe human habitation. Resettling people from some of these areas that are too remote, to other safe and available locations closer to public infrastructure would make it easier for government to provide basic services and emergency interventions when needed. This is a very important topic, which I am reliably told KK considered at some length when he started grouping villages together. One of the things that constantly strikes me when I travel to my village in Luapula is how sparsely populated the areas are. Its certainly does make the delivery of services that much more challenging. Also I wonder how parliamentarians cope!Perhaps ICT is the way forward? Information technologies help improve connectedness and offers the potential for a much more focused delivery of social services. More investment in ICT could diminish the case for physical resettlement. On new Zambian blogs - do check out Mwenya Mukuka's blog - focused on social issues. For areas that have no communications infrastructure, LinkNet will improve the future of rural areas in Zambia by providing telecommunications with internet. The key idea is simple, take sea containers normally used for shipping goods, fill them with necessary technology, place them in a rural area and then using wireless technologies to connect them to the internet. VSAT is the technology used, meaning Very Small Aperture Terminal which is an earthbound station that communicates with a satellite. This simple solution bypasses the need for massive (and longterm) investments in copper wires or glass fibres in the ground, and does not need mobile phone masts. LinkNet plans to take initially small but feasible steps, and then subsequently larger steps. LinkNet has already rolled out its first ‘proof of concept’ technologies in rural Macha, in the Southern Province of Zambia. The rollout of the LinkNet concept will offer rural Zambians a chance to communicate outside their own villages, provide new employment possibilities for villagers, support rural institutions in their communications needs such as schools, hospitals and churches, and support schoolchildren who cannot afford schoolbooks in their education by offering them access to the internet. You can read more about their masterplan here. I am particularly fond of their work on e-health. Incidentally, Brenda Zulu has a fascinating piece on her blog on the challenges of delivering e-health. A new paper provides new evidence on the linkages between income and incidence of malaria – an illness that claims over one million lives annually, 90 percent of which occur in sub-Saharan Africa. It it is entirely possible for an economy to arrive at a "malaria trap," in which sickness begets poverty and poverty makes disease prevention unaffordable. In the model economy, we can quantify the magnitude of this "malaria trap." It can reduce income per capita by about half. By point of comparison, Gallup and Sachs (2000) note that the 44 countries with intensive malaria burdens in 1995 had per capita income of $1,526, compared with $8,268 for the 106 countries without intensive malaria burden. Our model suggests that the disease alone could account for just under half of this income gap.